"41AN26, 2, GP 41057, TARL 2017.0131" by Timothy K. Perttula and Robert Z. Selden Jr.
DECORATION (INCLUDING MOTIF AND ELEMENTS WHEN APPARENT): The upper and lower portions of the carinated rim panel have a single horizontal engraved line with excised tick marks. Between these horizontal lines are three sets of five opposed curvilinear engraved lines with outward-pointing excised tick marks. The centermost curvilinear engraved line is not divided into two opposed sections. The vessel body has horizontal brushing marks. Patton Engraved, var. 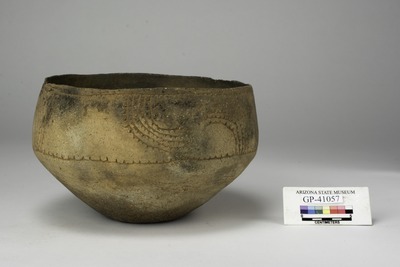 Patton carinated bowl from the Richard Patton site (41AN26).